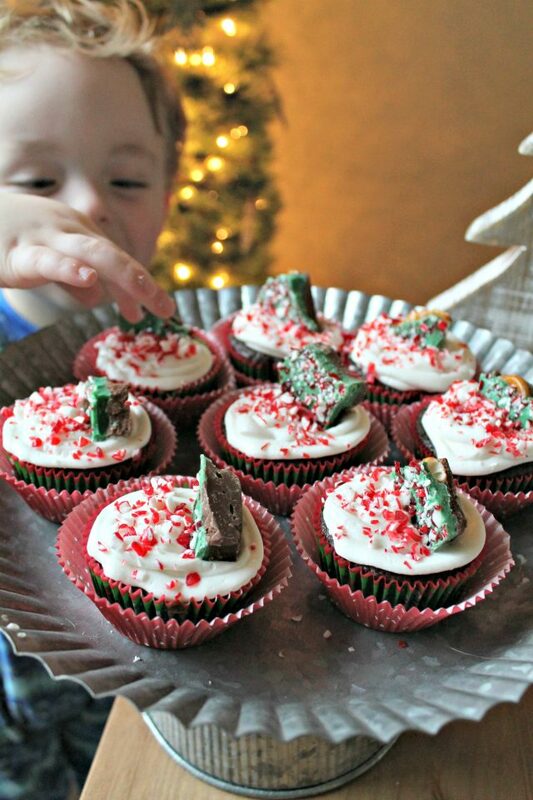 Keep scrolling to see how we made these adorable and Easy Holiday Bark Cupcakes! Hope you’re having a wonderful day so far! Making holiday treats is one of my favorite things about the season, and this year is no different. But making sweet treats doesn’t have to be hard work, in fact, it can be fun and REALLY easy! Don’t feel pressure to bake-from-scratch, why not start with by-the-box? 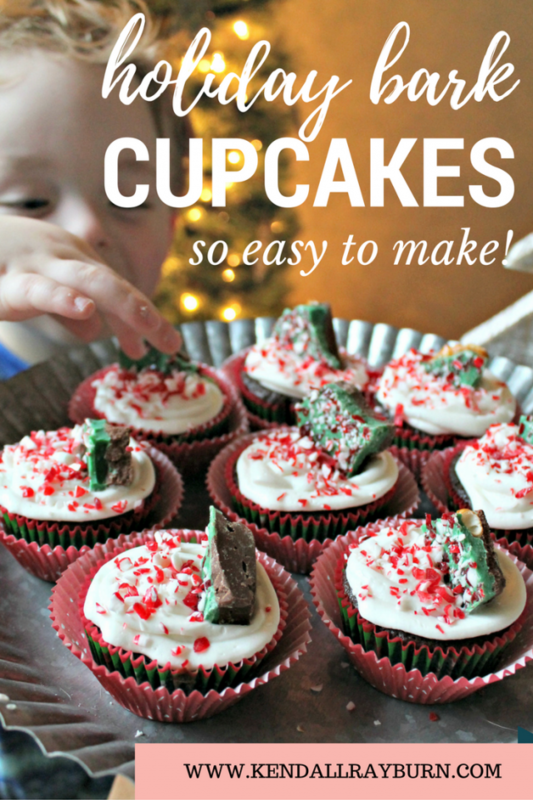 Today I’m showing you how to make these delicious (and oh-so easy) Holiday Bark Cupcakes! You can purchase holiday bark at the store to make this even easier, or follow our recipe for Quick and Easy Holiday Bark. Add another cupcake liner to dress it up! Didn’t they turn out cute? These are so simple even the kiddos can help! My boys love putting sprinkles on cupcakes so they were ALL about making these! What is YOUR favorite way to dress up from-the-box cupcakes? This is another recipe that I will surely add on my list. Perfect sweets for holidays. What a great idea! 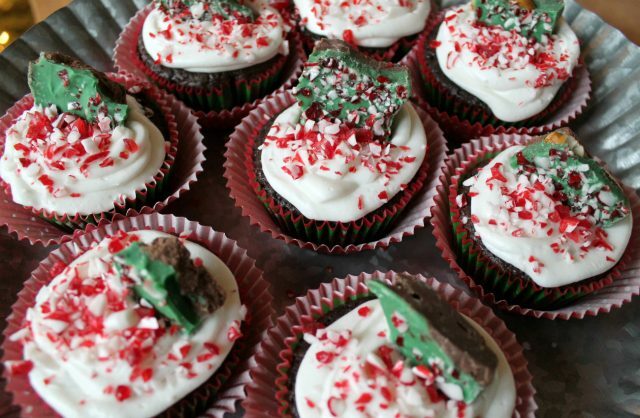 I love peppermint bark and cupcakes. Never would have thought to combine them! These look super tasty and what a fun way to add more decoration and flavor to the cupcake. I could also imagine the bark on its own is amazing. These look absolutely delicious! They are perfect for any holiday event! 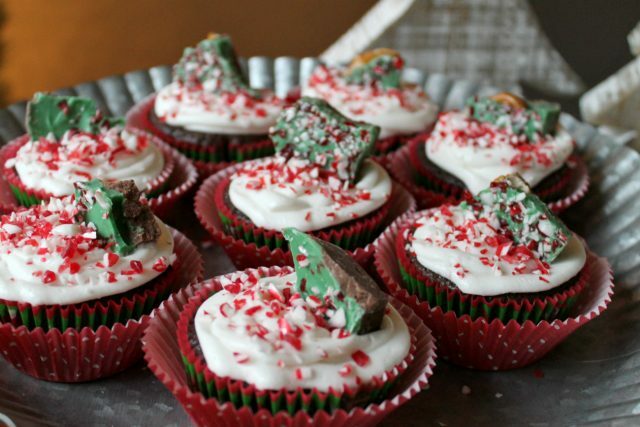 These cupcakes look so festive and I bet they are yummy. I might give your recipe a try one of these days. 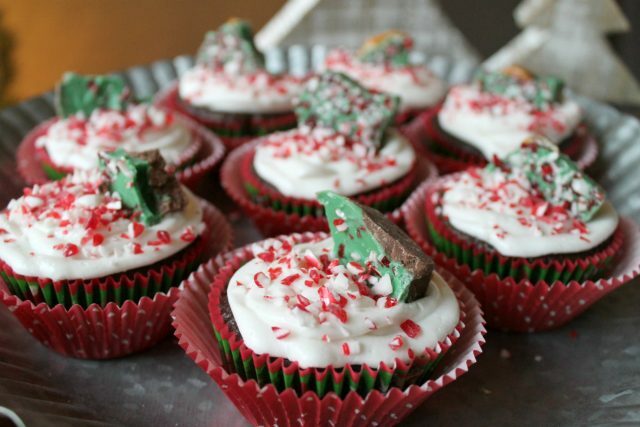 I am not a fan of peppermint and chocolate but these are the cutest holiday cupcakes! These would be great for a party. Now these cupcakes are adorable!! 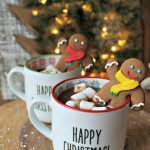 I could see myself making these for a Christmas party!! These cupcakes are beautiful and simple enough for someone with no kitchen skills, like my husband, to make. 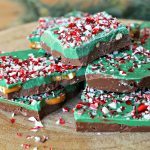 The bark and peppermint sprinkles just scream holiday party. Mmm, these look good. So simple but, so festive. Thanks! Wow these look so good! I know my daughter would enjoy them! What a festive idea! I love the addition of the bark on top!! These look so delicious and easy to make. I have been looking for some new recipes to try for the Holidays. I will have to give this a try this weekend. Those look so good. I love that they’re easy to make too. That means my daughters and I could make them together. I’ve seen bark in the store and wondered how to use it. Thanks for sharing. 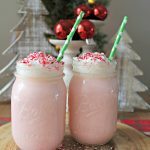 These are so festive and perfect for the holidays. My kids would totally love this! And they look easy to make, too! These cupcakes are so cute! My daughter loves to make treats with me. These look very simple and easy to dress up for the holidays. What a great idea! 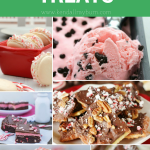 I love peppermint bark! Yummy!. Never would have thought to combine them with cupcakes! My kids wouldnt be able to keep their hands off those! Things like this always remind me why I gain weight during the holidays. I love easy recipes.. These cupcakes look so yummy we made a pretty similar recipe last year, sugar cookies with peppermint sprinkles..
Oh wow, those cupcakes are so pleasing to the eye. I bet they are just as pleasing to the belly too. I’ll have to let the grand kids help me make some.